Most cockroaches have a flattened oval shape, spiny legs, and grow long, filamentous antennae. Adult brownbanded cockroaches are light brown to glossy dark brown, are about 5/8-inch long and have wings. Males are capable of flight. Nymphs and females are broad when viewed from above, while the male is slender. The male's wings cover the abdomen, whereas the female's wings are short, exposing the abdomen. These roaches have two light yellow or cream transverse bands across the base of the wings and abdomen (twice banded). These bands may appear irregular or broken, but are usually quite apparent on the nymphs and females. Immature stages are smaller, have undeveloped wings and resemble adults. Egg capsules are about 3/16-inch long, crescent or purse-shaped, and yellowish or reddish-brown. Brownbanded cockroach females deposit egg cases in clusters inside furniture, undersides of tables, draperies, wall decorations, shelving and ceilings. The egg capsule contains 14 to 16 eggs; a female produces 10 to 20 cases in her lifetime. Eggs hatch in 1-1/2 to 2-1/2 months, and nymphs develop in 3 to 9 months, with adults living 5 to 6-1/2 months. Females carry the egg capsule for 1 to 2 days, and then glues it to some object. These roaches are active at night, and nymphs and adults jump rapidly when disturbed. Adults are fair flyers. 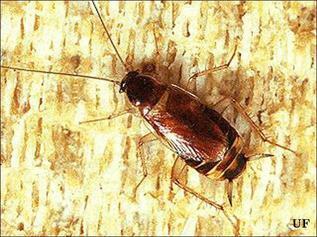 These pests do not require as much moisture as German roaches and tend to avoid light. The roaches are commonly transported in furniture, luggage and other items into homes and soon develop into annoying infestations under warm, humid conditions (80 deg F temperatures preferred). Control is difficult since they live widely dispersed as individuals scattered all over the premises. Treatments must be extensive or directed at population sources determined by bait trapping. Traps can determine infestation severity and monitor chemical controls, especially with brownbanded and German roaches. Adults die within two weeks without food and water. Brownbanded cockroaches can be detected by examining the premises after dark with a flashlight. During the day, probing hiding places with a wire will expose roaches. Look beneath tables, chairs, dressers and chests, behind pictures, on rough plaster walls and ceilings. One may find tiny black droppings or castoff skins where they have fallen from above onto shelves or ledges. They dislike light and are not normally seen during the day. Household sprays of pyrethrins applied to hiding places will flush out roaches, sometimes killing them if they contact the spray. Since brownbanded roaches commonly hitchhike into the home, it is important to inspect furniture, clothing, sacks, cartons, boxes, etc., brought into the home. Destroy any roaches present. Sanitation is critical in roach control. They do not require as much moisture as the German cockroach, which explains their presence in rooms other than the kitchen or bathroom. Seal openings with putty or plastic wood.